Divination is the 26th skill in RuneScape. It was released on the 20th of August 2013. 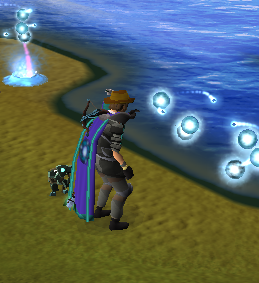 Divination involves siphoning memories and energy from wisps that float around in colonies across the globe; these wisps are residual life force of the dead god, Guthix. 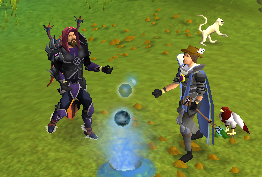 Training your divination can be fun, but also can take a while; be aware of slower rates of XP as you start off. 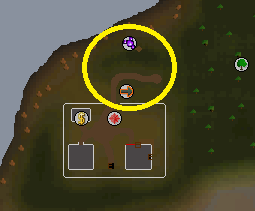 To start off Divination, proceed to the Divination camp south of Draynor Village and west of the Battle of Lumbridge crater. Here you can find a group of keen adventurers intent on levelling their own Divination. Speak to Orla Fairweather and she will show you the basics of training Divination. Deposit Memories AND Energy in exchange for even more XP. You will earn around 25% more XP this way. When Depositing Memories AND Energy, for every Memory you deposit you will also deposit 5 energy. 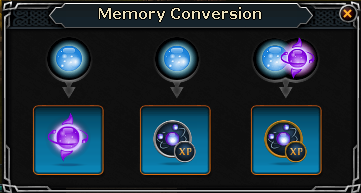 When depositing an Enriched Memory, you will use 10 Energy, but you will gain double the XP of using 5 Energy. 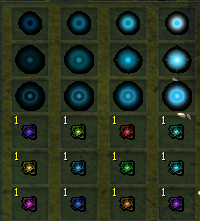 This will be the main method for levelling up Divination. In the middle of a spring, there will be a purple tongue of flame, and this flame is a timer to show how much longer the spring will last before collapsing. The higher the flame, the more time the spring has before it will collapse. Energy is a stackable item that comes in 12 different tiers, corresponding to the 12 tiers of wisps. Energy can be woven into various different items which are made for use outside of the Divination skill. At 75 Divination, you will begin to harvest 3 energy from a wisp at a time, and that means you're in the money now. If you plan on using energy to speed up your XP gain, rationalise it. Don't bother using it though until you reach the 70's spot, you just won't gather enough to make it worth it. A good idea is to gather 50,000 energy, and then begin to use it. This will last you for quite a while, and when it runs out, you should be fairly close to the next spot. However, if you plan to not use energy, you can make quite a large profit from selling energy all the way up to 99. Another good idea is to always bank a fair amount of energy that you will not train with, but will be readily available to you whenever you wish to create Divination rewards. ALWAYS save enough energy for the next boon you will need. A "Boon" is a reward which can be woven from energy at specific Divination levels. Creating a Boon unlocked the permanent effect of gaining 10% bonus XP from the next tier of Wisps. Creating a Boon is unlocked at level 10, 20, 30, and so on. It is definitely highly recommended to create a Boon as soon as you are able: it requires a few hundred Energy from the tier below OR the same tier to create a Boon, so save some while you level up. There is NO excuse not to make these. Chronicle fragments are orange orbs that will appear frequently around wisp colonies. When you harvest from a spring there is a 1/25 chance approximately of one spawning. The chronicle will only be available to you for a short amount of time, but if you don't catch it quickly everybody will be able to see and catch it. Catching them will earn you hunter XP in your level x10. 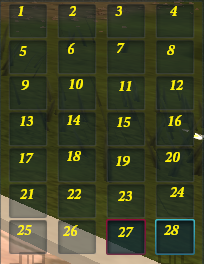 You can may hold up to 30 Chronicles at a time, but once you have 10, the spawn rate of Chronicles will begin to slow down, and you can either take them to the Guthix Shrine (requires completion of The World Wakes) or talk to May Stormbrewer at the Divination Camp west of the Battle of Lumbridge crater. Doing so will earn you a small sum of XP dependant on your level. After handing in chronicles, you need a way to return to the wisps as soon as possible. Handing in chronicles is only worth it if you own a Sixth-age Circuit, a reward from the quest The World Wakes, and if you meet the requirements for the additional rewards. If you do decide to hand in your chronicles, make sure you have a method of getting back to the wisps as quick as possible. The Elder Halls can easily be returned to with your Sixth-Age circuit ring, or otherwise use the lodestone to Eagles peak and run south. The Mage Arena wisps require the use of a Tokkul-Zo, which requires completion of the Elder Kiln quest, and either a Lunar/Dramen staff, and have started the quest Fairy Tale Part II – Cure a Queen. (A staff is not needed after completion of Fairy Tale Part III – Battle at Ork's Rift). After handing in your chronicles, teleport to the fight caves, and run north and use the fairy ring. 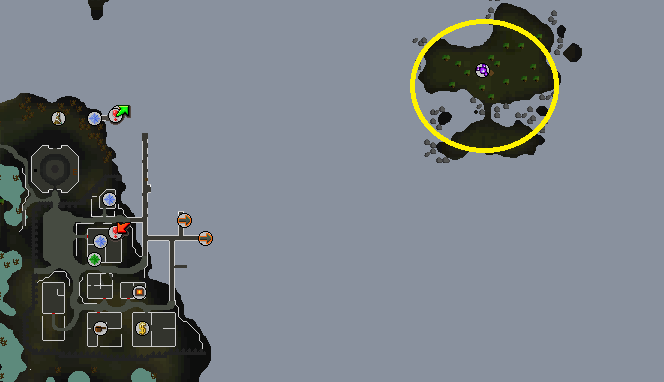 Then use the master ring there to teleport to the entrance of the Polypore dungeon – the code is B I P. Run south and you'll find the wisps. The Poison Waste wisps are not difficult to get back to, but can be made easier with certain setups. 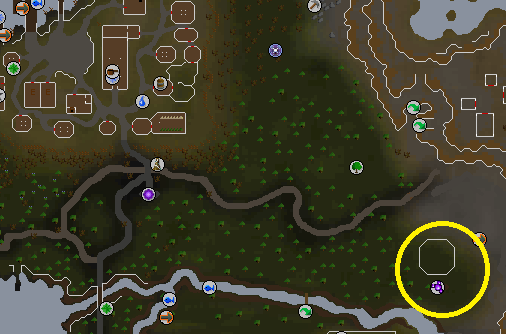 One method involves using a ring of duelling to Castle Wars and running west from there. Another involves using a ring of duelling to mobilising armies, and requires you to be mid-way through the quest The Path of Glouphrie, a Mith grapple, and a crossbow. Off-hand crossbows work with grapples, which means you can still use your Yaktwee Stick. Take the spirit tree to the canyons east of the poison waste, run south, grapple across the tree, and then run west across the bridge to the wisps. 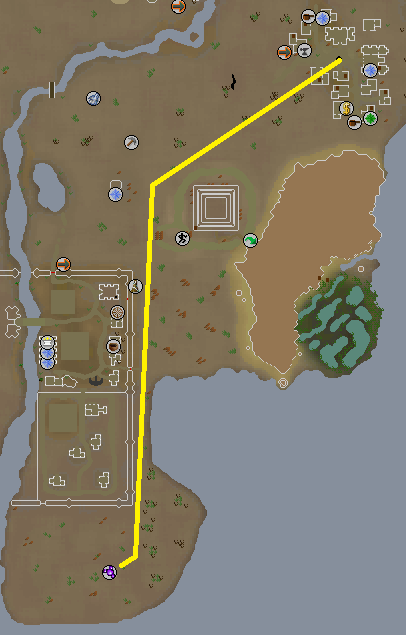 An optional item you can use for this is an explorer's ring 3, or 4, which requires completion of the Lumbridge Medium and Hard Task sets respectively. 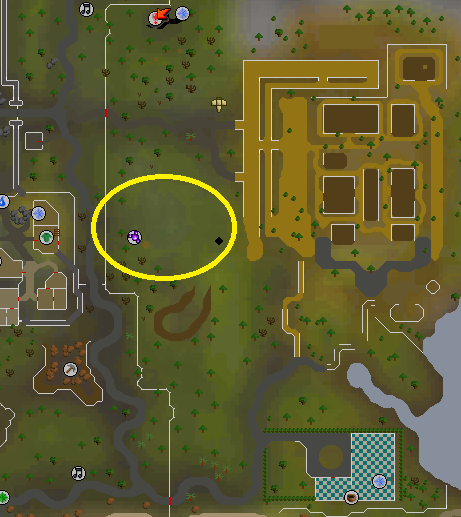 If you have 78 Farming, you can plant a Spirit Tree (if you use a Pork Pie to boost 5 levels for the 83 required to actually plant it) at the Port Sarim patch. From there you can cabbage-port with your explorer's ring and run south to the Spirit Tree, and repeat the process as above. 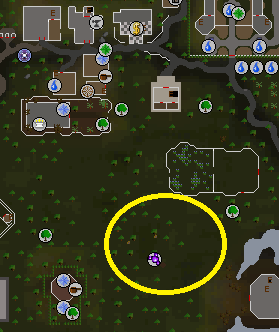 If you already have a Spirit Tree planted somewhere else, you must either remove it, or finish the quest Prisoner of Glouphrie, and at level 86 Farming (81 with a Pork Pie) you may plant another. If you already have two planted in different places you must dig one up. A good way to get Spirit Seeds is by killing Ganodermic beasts, or bird's nests from your Managing Miscellania Kingdom. Many players view using the Desert as a waste of time and effort, as XP rates between the two spots are similar. A few advantages of the Dragontooth spot include it being much easier to return to after handing in chronicles and you do not have to deal with desert heat. The desert heat problem can be worked around, however. If you own an enchanted water tiara from finishing the quest Dealing with Scabaras, it will protect you from desert heat at the cost of water runes. If you wear full desert robes, you will drink every 2 minutes. Drinking uses up 3 runes from your tiara. 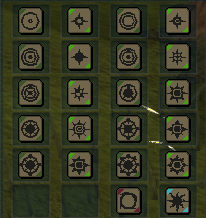 The price of maintaining this per hour is (n x 90) where 'n' represents the price of a water rune. Another method involves wielding a Tome of Frost in your offhand - if you wear full desert robes, a regen brace, and the Tome, you will easily be able to tank the damage you receive, as the Tome drastically lowers how much damage you take from desert heat. If you do not plan on handing in chronicles, the desert spot is better if you have either of these items. 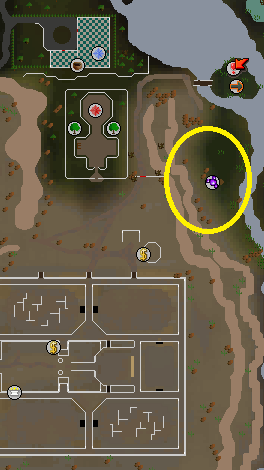 If you have the desert amulet 2 handing them in is still an option, just not as efficient as Dragontooth Island. The choice is yours. Either way, when you hit 95, you're done with both of those spots for good. Elder Divination is an expansion added to Divination in early May of 2014, and is a follow on reward from the quest Fate of the Gods. This update added a new Divination Colony, 10 new rewards, a new boon, and Elder Chronicles. 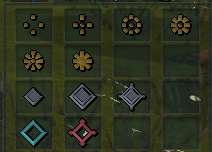 Elder Chronicles function similar to regular chronicles, however, once you get 10 Elder Chronicles, you can hand them in at the Guthix Shrine for a piece of lore. You may do this 10 times, and unlocked all 10 pieces is a requirement for the trimmed Completionist Cape. Enriched Springs are a special type of wisp that will spawn approximately every 20 minutes. They look about twice the size of a normal wisp. Enriched Springs are VERY useful because when collecting from them, you will ONLY gather Enriched Memories. Enriched Memories look similar to normal ones, but will glow brighter. These will earn you double XP both when depositing them AND harvesting them. Enriched Springs are important to training, because the double XP gained from them while they last can be very helpful. Enriched Springs will spawn once every 20 minutes, and are always on the 20 minute, 40 minute, and on the hour of every hour. The more players interacting with the Enriched Spring, the longer it will last, so make sure you don’t miss any of them. When first harvesting from an Enriched Spring, one regular memory in your Inventory will be converted into an Enriched one, and doing this will increase the length of time the Enriched will stay. This can only be done a certain amount of times per spring, so if it does not work, than enough players have done this already to max out the timer on the spring. Enriched Memories also have a rare chance of being obtained from normal Wisps. 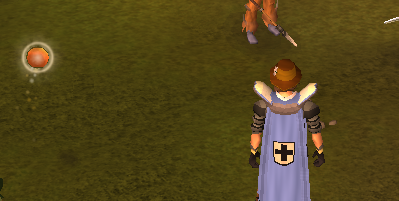 When training Divination, wield your Enhanced Yaktwee Stick if you have one. This will earn you extra hunter XP when catching chronicles. Always save enough energy to create the next Boon, as it is vital that you make these. As soon as you get 10 Chronicles, use them, because you won’t be able to catch anymore until you get rid of them. Try not to miss any Enriched Springs. If you miss it, you will have to wait quite a while for another one. If you can, use Nightmare Muspah familiars. Summonable at 81 Summoning, these act as a beast of burden, but can only hold Divine Memories. Memories will automatically be placed in the Muspah, and also automatically used when converting at a rift, so it is no hassle to have with you. They have 32 spaces in which to store Memories. These familiars also give a slight passive boost to your chance of obtaining Enriched Memories, and will last for 58 minutes. Always advance to the next tier colony as soon as possible. The gathering rates are the same, except you will earn more XP at higher colonies. 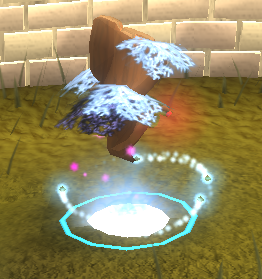 Like other resources in Daemonheim, wisps can be found floating around in various rooms. If you find a room with a wisp in it, all wisps inside will be of the same kind. Eg: Pale, Radiant, Lustrous, etc. There are two rewards that can be made with energy in Daemonheim: Portents of Restoration, except with Dungeoneering food, and Portents of Passage. These are one-use items that will allow you to open skill doors you do not have the level for, by a certain margin. These boosts DO stack with potions. There is a rift in the spawn room for you to dump memories into, and unlike the surface, memories stack in Daemonheim. All portents heal the same amount that the food would heal if consumed normally. As you can see, the memories stack alongside the energy inside Daemonheim. There are many types of rewards available with Divination. There are three main types of reward: Sign, Portent, and Divine Location. There are many types of all of these, so lets get cracking. Signs are single-use rewards used in the pocket slot. Upon death, if wearing a sign of item protection, one extra item will be kept on death. This stacks with the Protect Item prayer and curse. This requires level 69 Divination to make, and the ingredients are 45 vibrant energy and 4 prayer potions (4). If worn when killed, you will be ressurected and returned to 25% base life points. This sign has a cool-down period of 1 hour which is shared with the Portent of Life. This cannot be used in PVP areas and does not work everywhere. If used at Vorago, the 50,000 damage initial blast still has the ability to kill you, and will not activate when pushed off the end of the cliff at the end of the fight. This requires level 78 Divination to make, and the ingredients are 100 lustrous energy and a diamond ring. The Sign of Death has the same function as the Sign of Life, but with a little twist. They are slightly more dangerous to use, but also give a backlash to who or whatever killed you. If you die, you will be restored to 15% health instead of 25%, but you will also damage your opponent by the same amount. These share cooldown timers across Signs and Portents of Life and Death. Signs of Respite can be used to extend a grave timer by certain amounts of time. They can be used immediately whilst a gravestone is active, using them up and adding minutes to the timer, or can be activated on death and will cause the grave to have a longer timer. The time extensions are 2 minutes, 4 minutes and 6 minutes respectively. Signs of Respite are tradeable. The Sign of the Porter is an item that will teleport a select group of items directly to the bank as they are obtained. The list of items ranges across multiple skills. Signs of the porter will become active when equipped and will change from dull to bright. Portents are items that you can keep in your inventory and will activate upon certain circumstances. The main Portent available to players is the Portent of Restoration; these automatically heal you when your health drops below 50%. Portents of Restoration are always made out of a food item and a varying amount of energy, depending on Portent and level required. The amount the portent heals you is dependent on your combat level. There are also Attuned Portents of Restoration available. These require a Constitution level to create as well as a Divination level, but will always heal you the full health of what the food item would originally heal you. Regular Portents of restoration will heal you slightly less per food item. Regular portents require the Constitution level to be consumed, but not to be created. Attuned Portents are untradeable. There also two other Portents available to players, The Portent of Item Protection and The Portent of Life. Portents of Degredation are similar to Portents of Restoration, but heal slightly less, and will also damage your opponent for half the amount that you have been healed. All are made from Elder Energy, and are Elder Divination rewards. All Portents of Degredation also require completion of the "Fate of the Gods" quest. The Portent of Item Protection requires 92 Divination, and requires 60 Luminous Energy and 4 Prayer Potions (4). The Portent of Item protection stacks with other means of protecting items and will let you keep an extra item upon death. This portent has a cooldown of 1 hour, paired with the Sign of Item protection, and cannot be used in PvP. The Portent of Life requires 99 Divination, and requires 100 Incandescent Energy and one Diamond Ring. This Portent will resurrect you upon death and restore you 25% of your Lifepoints. It will not save you from Vorago's 50,000 Damage attack and will not work if you are pushed off the edge at the end of the battle. This cannot be used in PvP and has a 1 hour cooldown paired with the Sign of Life. The Portent of Death also requires 99 Divination and a Diamond Ring, however with 100 Elder Energy instead of Incandescent. These mimic the Portent of Life, and will ressurect you upon death. However, these ressurect you to 15% of your Lifepoints instead of 25%, but will damage your enemy the same amount you are healed. These share the same cooldown timers, and will activate and not activate upon the same circumstances as the Portent of Life. Transmutations can allow a player to turn resources into a higher tiered resource. For example, you may turn 3 Iron ore into Coal. This will require a small amount of energy to do so. Here is a list of the Transmutations available. 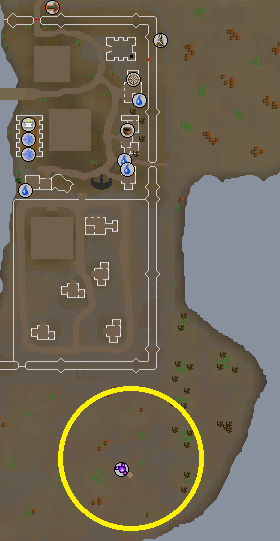 The most useful reward to your Divination training, Divine locations are various skilling nodes you can create (similar to the ones at the RuneSpan) and can be placed wherever you can light a fire. Other players may harvest from these if they have the requirements to do so, and the more the better – the placer of the location will earn extra, noted resources, whilst others skill from their location. 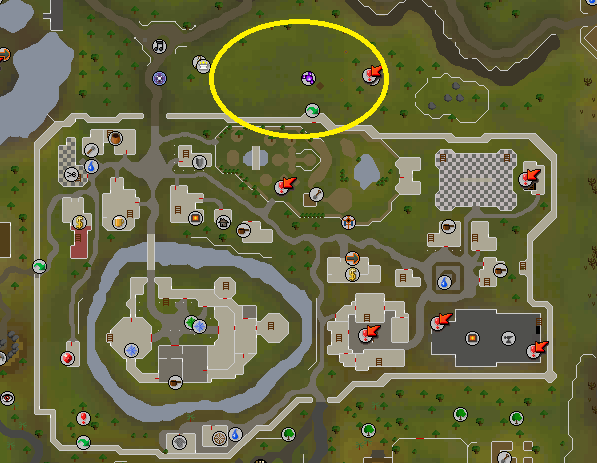 A player may only create and place one location per day, and there is a limit on how many resources can be gathered per day, depending on your total level. Your limit is your total level divided by 10. So just remove the last number from your total level, and the result is how many you will be able to acquire. 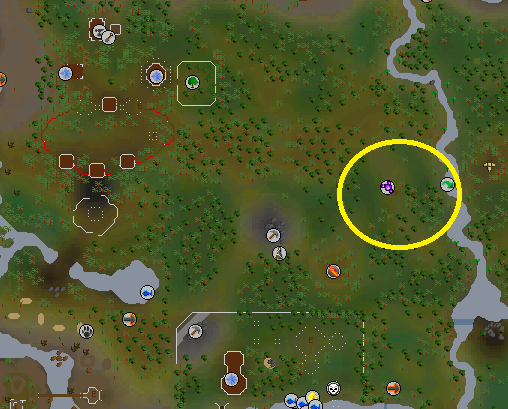 There are Divine Locations for the Mining, Woodcutting, Farming, Hunter, Fishing, and Divination skills. 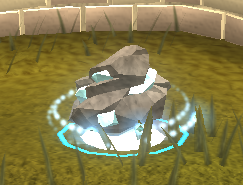 These rocks require 1, 15, 30, 55, 70, and 85 Mining to mine from respectively. The Varrock armour has no effect on these rocks and neither does the Imcando pickaxe. The Inferno Adze has no effect upon these trees. From Divine Traps, Herb Patches and Simulacrums, you will receive an array of rewards, but only those of which you have the requirements for.Some patches will fill up your daily limit faster than others, and some much faster. The Divine Deadfall Trap, Herb Patch I and Magic Tree will fill up your daily limit twice as fast. The Divine Adamantite Rock will fill up your daily limit three times as fast. The Divine Herb Patch II will fill up your daily limit four times as fast. The Divine Simulacrum II will fill up your daily limit four times as fast. The Divine Herb Patch III will fill up your daily limit eight times as fast,and the Divine Rune Rock will fill up your limit twelve times as fast. 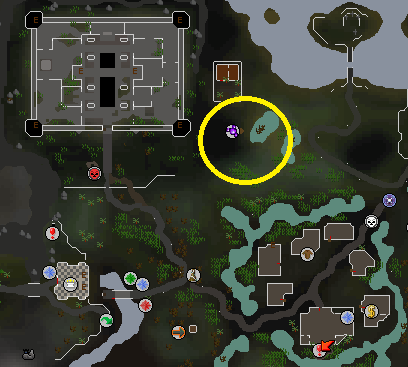 All Divine Locations will remain active for roughly 30 seconds, however the Divine Herb Patch III and Divine Magic Tree will last roughly 25 seconds, and the Divine Runite Rock will last roughly 20 seconds. 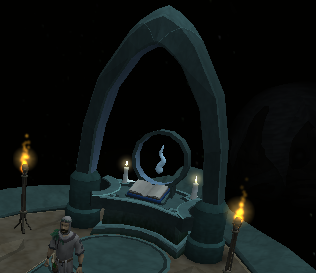 Once you achieve 99 Divination, you may head over to Orla Fairweather and pick up your cape for 99,000 Coins. The emote involves you slowly shrinking into a wisp, flying around in an arc before landing on the ground and becoming a human again. Check out the author's editorial for more tips on training Divination.